Snapsafe is dedicated to supporting our product line and helping consumers with questions they may have. Please review the options below to find answers or to direct your inquiry to the proper department. If you can’t find the answer to product question by using the search function that appears at the top of every page or by visiting the FAQ section or User Manuals page, please submit your question and we will respond in a reasonable timeframe. If you have a warranty question or need assistance returning a product you have purchased, please submit your question and we will respond in a reasonable timeframe. Orders are fulfilled by Firefly Buys. You can track your order status by logging into your account or going to the Order Status page. Order history from our old site (prior to June 26th, 2017) is not available online due to the initiation of a new order tracking and fulfillment system. If you have questions about a current order, submit your inquiry and Firefly Buys will respond in a reasonable timeframe. SnapSafe offers an online Retail Locator that allows customers to search for SnapSafe® retailers within their area. If you are a retailer, but are not listed on the Retail Locator, please complete the Retail Listing Form. This form is intended for retailers who already stock SnapSafe products and is not a sign-up for becoming a retailer. If your listing on the Retail Locator is not accurate, please submit your changes here. 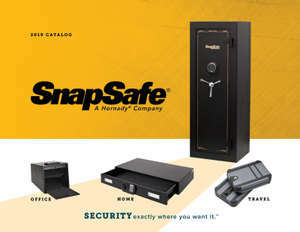 I’d also like to be among the first to know about new SnapSafe offerings and services. I understand that I may unsubscribe from these offerings at any time.